Just in time for the back-to-school shopping season, tech's greatest rivalry is back. No, I'm not talking about Apple vs. Google; that's small potatoes. Long before Google launched its Android assault on Apple and its iPhone, Microsoft and Apple were publicly doing battle for supremacy in the personal computer market. And now, thanks to Microsoft's latest campaign to mock the Mac, the rivalry has been renewed. Microsoft this week added a new "PC vs Mac" section to its Web site, which touts the advantages that Windows-based PCs have over Macs. The multi-page site, which highlights the fact that Windows-based PCs can "easily share" Microsoft Office documents and play Blu-ray discs, was launched just days after a new report suggested that Macs have become the computers of choice for incoming college students. Forty-seven percent of college students who plan to buy a new laptop planned to buy a Mac, the report, which was published on CNN.com and based on figures from Student Monitor, a research firm that tracks higher education computer purchases. 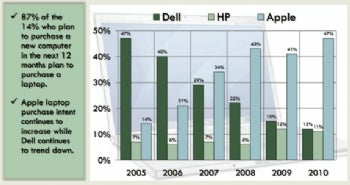 Student Monitor notes that Dell used to be the laptop brand of choice for college students, and says that in the last five years, Dell and Apple have swapped places: "In 2005, 47 percent of students buying laptops chose Dells. In 2010, 47 percent are choosing MacBooks." Student Monitor's numbers show that interest in Apple computers has increased as interest in Windows-based PCs has decreased. Image Source: Student Monitor. These numbers can't be making anyone in Redmond happy, and it's clear they haven't escaped Microsoft's notice. The new site clearly touts Windows features designed to appeal to college-aged students, as the first topic in its itemized list of the PC's advantages is "Having Fun." "When it's time to enjoy movies, games, and HDTV from anywhere in your home, PCs are ready to play," the new site reads. "There are some things you simply can't do out of the box with a Mac, like watch, pause, rewind, and record TV like a DVR." This section of the site also highlights the fact that "most of the world's most popular computer games aren't available for Macs." The site then goes on to tout the simplicity of the PC, noting that they "just work." (Hey, that sounds familiar.) Only then does the site go on to talk about the "working" capabilities of the PC, highlighting its ability to easily share Office documents and give presentations. "If most of the computers in your office or school run Windows, you may find it harder to get things done with a Mac," the site notes. Microsoft's latest attack on Apple isn't as high profile as some of the earlier salvos in this bitter rivalry. A Web site alone (there's no word on whether Microsoft plans to expand this campaign to print or TV spots) isn't going to gain the attention of Apple's "switchers" ad campaign, or its classic (but recently pulled) "I'm a Mac" ads. Nor is this site going to gain the attention of Microsoft's "laptop hunters" ads. But maybe it doesn't need to: Windows 7 is, after all, the fastest-selling operating system in history, so Microsoft clearly is doing something right. Still, it's clear that Microsoft isn't willing to sit back and watch Apple gain any ground. That rivalry has always been fun to watch and I, for one, am glad it's back. Here's hoping this site is just the first strike of many to come.